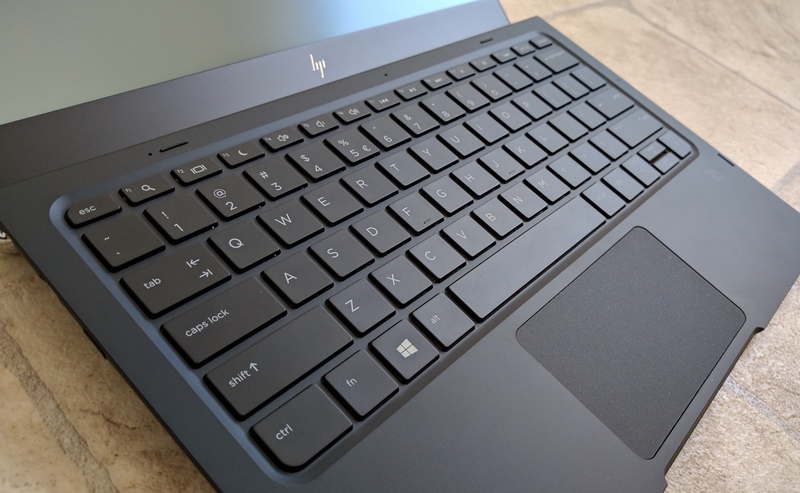 Thinner than the thinnest netbook or ultrabook, very solid and made (almost) completely from premium materials and components, the HP Elite x3 Lap Dock is a curious piece of technology. Designed as a laptop form factor to function as a Windows 10 Continuum display, is it a glimpse of the future of mobile computing or an ultra niche accessory? Actually, a little of both. Does it work? Is it finished? Is it over-priced? These are questions that I'll be answering in my multi-part review here on AAWP. The HP Elite x3 (note that HP seem to always now be using a lowercase 'x', as in 'times 3', so I'm doing the same) is currently the unchallenged flagship of the Windows 10 Mobile world, given the - IMHO premature - effective withdrawal from sale of the Microsoft Lumia 950 and 950 XL in most markets and the currently region-specific nature of the 'Alcatel IDOL 4S with Windows 10'. And, as such, it's entirely appropriate to spend some time on AAWP looking at one of those '3' hardware elements - the Lap Dock that turns your smartphone into a laptop. Well, almost. We've seen 'lap docks' before (e.g. here, here and here), but they've all been either (still) unavailable, poorly made, under-specified or (often) all three together) - you can see why HP decided to implement the concept properly, with decent hardware and the full weight of HP's distribution and support network behind it. In fact, the Elite x3 Lap Dock has arrived somewhat later than planned, but it does seem to be reaching reviewers (like me) this month and no doubt will start picking up end user/business sales in due course. 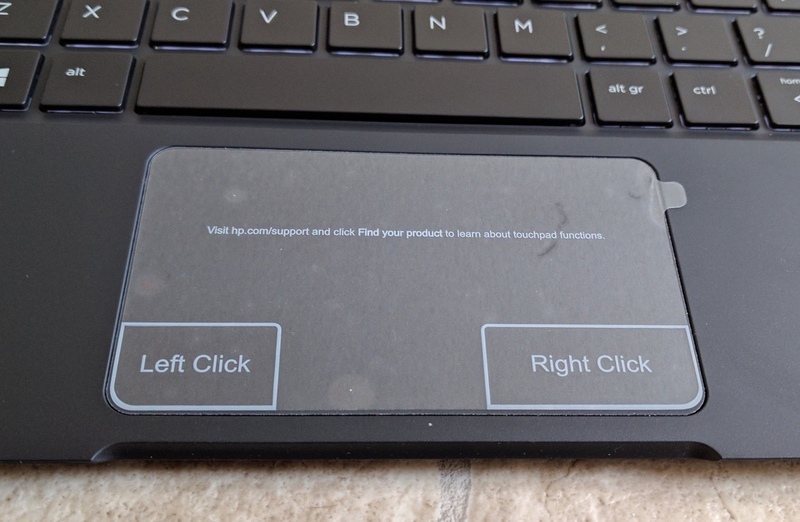 Just in case you're playing catch-up here, a 'Lap Dock' in this context is a keyboard/screen clamshell, with associated internal electronics and firmware to allow it to appear as a Continuum secondary display to a compatible Windows 10 Mobile handset. In use, it's no different to a standard TV or monitor being used for Continuum, except that there's potentially less wires here - you already have the keyboard and pointing device built-in. I've used a number of Continuum docks and adapters and the HP Lap Dock is my favourite bar none. Admittedly it's also the most expensive, but we'll touch on that later on in part 3 of this review. The x3 Lap Dock hardware is stellar on the whole, only 13mm thick, yet very solid and with good battery life (of which more later). There's a high quality 12.5" 1080p display that opens up to a full 135 degrees from the closed position, making it a doddle to get comfortable with (so many other netbooks and other solutions don't open far enough). Windows 10 (Mobile) looks particularly good on it, thanks to the tiles and straight-edged interface generally, plus the rich colours in some applications and the default Continuum wallpaper. The other star component of the x3 Lap Dock is its keyboard, which is fabulous. It's certainly the equal of that in the best standalone laptops, with great feel and key movement, knocking spots off the latest Macbook Pro (for example). The layout is a full PC arrangement, in use it's almost indistinguishable from 'Desktop' Windows 10 when you're in an application and working away. The top key row has a full set of ancillary functions, with F1, F2, etc. being the default and you have to press the 'fn' key to activate the ancillaries. This can be a bit frustrating, especially since the latter are surely a hundred times more likely to be used than traditional Win32-style F-key assignments, especially in UWP applications here? Helpfully, the keyboard is also backlit when needed, with a choice of two backlight brightness levels - it's very even too, adding to the impression of quality. You do have to control the keyboard backlight yourself (via a function key toggle) - I was happy with it permanently set to the 'dim' setting, a compromise between visibility and power saving, but it's very much up to you. In daylight or a brightly lit office or train (etc.) you may not need the backlight at all. 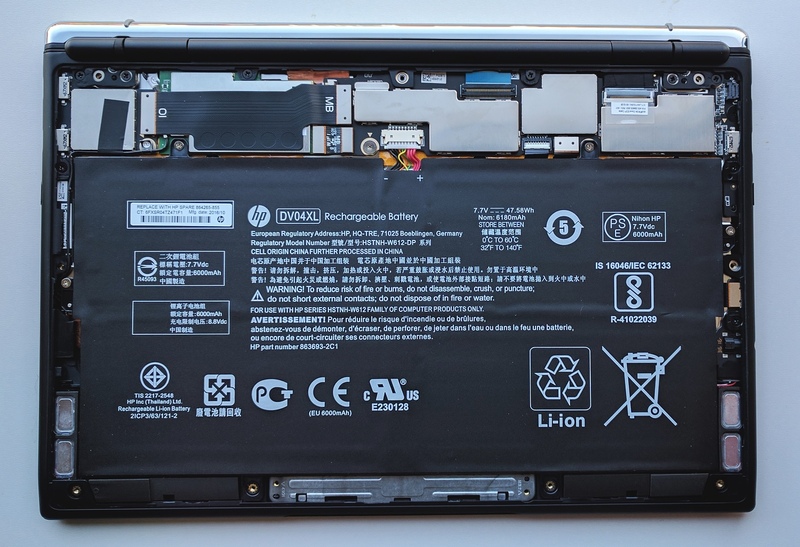 When looking at the high price of the Lap Dock (again, of which more later), it's perhaps not surprising that really high end components have been used here by HP. So far, at least - the one fly in the ointment is the trackpad, which feels much cheaper. It's perhaps not, but the top hinged assembly and the flexible plastic used feel more at home on a much, much cheaper device. In fairness, the trackpad's positioning of the cursor and the positive nature of the bottom left and bottom right 'buttons'/areas has been nigh on faultless - it's perhaps telling that I'm coming from a Macbook here and these tend to have the absolute best trackpads in the business. So perhaps it's all relative - it's certainly subjective. The B&O logo on the bottom right of the keyboard (as on the phone) indicates that there's some decent audio on board - indeed if you look at the internals photo a few pages below then you'll see four speaker components, producing a loud, high quality stereo sound when playing media, streaming movies, and so on, on the phone (through this Continuum hardware). The integration of audio, video is stunningly well done - as with productivity software, what's happening on the Lap Dock (e.g. playing a video stream) is totally independent of what's happening on the phone (in this case, the Elite x3) screen, so it's perfectly practical to watch a YouTube video while browsing a web page. And then switch it so that you're browsing the web page on the Lap Dock and the YouTube video is now on the phone screen. I can't emphasise this enough - Continuum is simply a way of enabling a secondary display for your high tech Windows 10 Mobile smartphone. That the secondary display, in this case, also comes with keyboard, trackpad and speakers, is a bonus. The use case, therefore, is that you can bash out some emails or browse an article or watch some media - in fact, everything you'd normally use a full laptop for, with the exception of running legacy Windows x32/x64 applications. And it all works perfectly most of the time, with even performance not really being an issue - although individual applications are ultimately slower than their counterparts on a similarly priced 'Wintel laptop', on the plus side there's also no overhead waiting for a hard disk or a Windows swap file or the other background detritus of Desktop Windows/Explorer, etc. You can plug things into the HP Lap Dock too, extending the boost in functionality from 'just' a screen/keyboard/speaker system to include mains power, external storage (USB flash disks, hard disks, even USB speakers, cameras (at least, in terms of accessing their storage), and more. 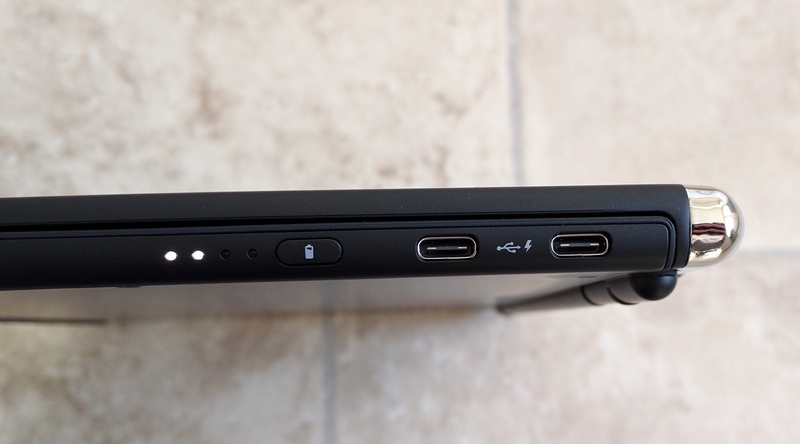 The two USB Type C ports on the right hand side are the same and each support power (e.g. for charging the Lap Dock or charging something else, such as a phone) and data. 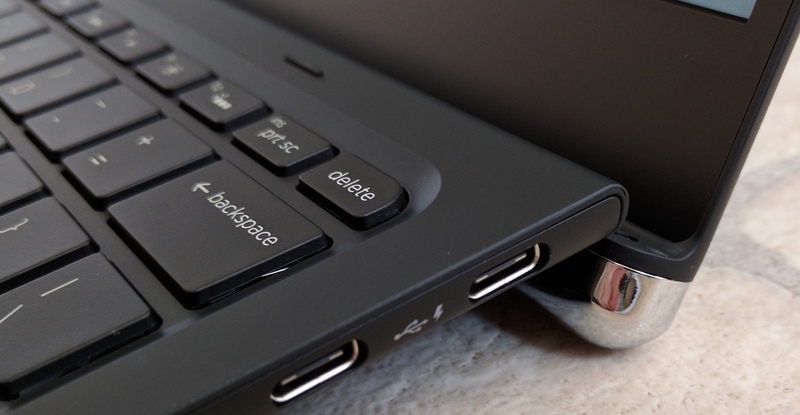 The Lap Dock comes with a female USB Type A socket to USB Type C dongle and this is useful for hooking up traditional USB storage or a mouse, for example. What you connect is, as they say, limited only by your imagination and everything I've tried so far works - as indeed it should, given Windows 10's common code across Mobile and Desktop and given HP's quality electronics here. You even get the standard Windows 10 Desktop 'device attached' sound effect when plugging something in! No doubt I'll have some outrageous examples of this in weeks to come on AAWP and I'll be demoing this in part 2 of the review. On the left hand side is another USB Type C jack, this supports video as well, which means that it's the port that you have to physically connect the Elite x3 (or Lumia 950 or whatever) to if you're going for the optimum, wired Continuum experience. 'Optimum' not just in terms of speed but also in terms of supporting other devices, as the various USB connected disks mentioned above only get 'seen' when there's a physical connection. This is perhaps to be expected - you'd typically only use the wireless connection to the x3 Lap Dock when you're after a quick and simple Continuum session. For anything more heavyweight, use the supplied Type C cable and jack in properly - it's faster, smoother, more capable, and you get to charge the phone at the same time. 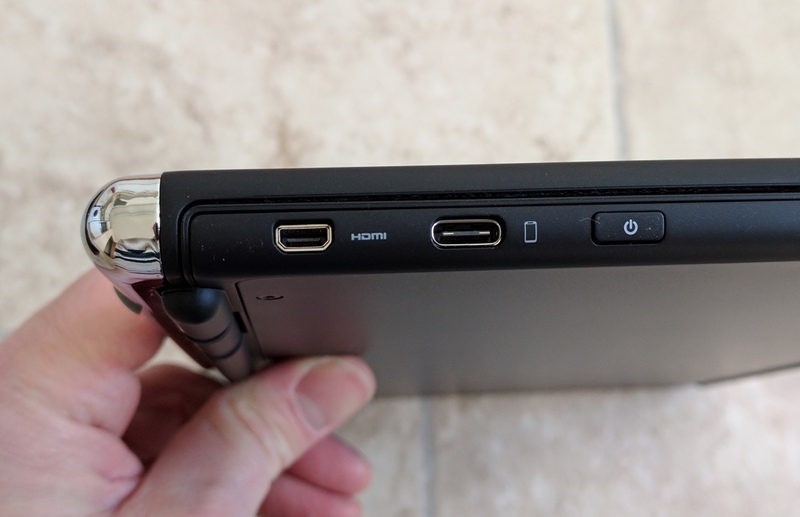 There's also a microHDMI port, the idea being that in an office environment you could mirror or project your Lap Dock Continuum experience to a much larger (DisplayPort or HDMI) display or projector, perhaps for doing a presentation. There's even a toggle on the function keys to activate and de-activate this, helping you control what the room sees rather than have them watch you fiddling around and queuing something else up in the Windows interface. This works well, though I'll bet that (like me) most people will have to go buy a £6 micro-HDMI-to-whatever cable, since the former isn't that widely used in offices. A 3.5mm audio out jack is a nice touch, possibly of more use being routed through to external speakers if appropriate (e.g. during a presentation), plus a couple of microphones above the keyboard - I'm still trying to identify the use case for these, given that there's no integrated webcam. With the phone and its excellent microphone and camera physically alongside the Lap Dock, the microphones seem a bit redundant right now. Comments welcome if you can suggest a use case. Inside the Lap Dock is a surprising amount of electronics - but then there's a lot going on in terms of linking up all the ports and peripherals. Plus a large (but thin) 6180mAh battery, as you can see below - I took the bottom off (Torx screws, but I know what I'm doing) to have a quick peek. In practice, battery life is a maximum of six hours of use, though this will drop quite a bit if you're jacked in via USB Type C since the Lap Dock is then having to charge the phone as well. Battery life is slightly more when using wirelessly - I'll report more on real world use when I have a few weeks under my belt. But in general, if you were taking this out on the road then a nightly charge is probably a good idea. If all this sounds rather idyllic and gushing then don't worry, there's a big caveat coming. 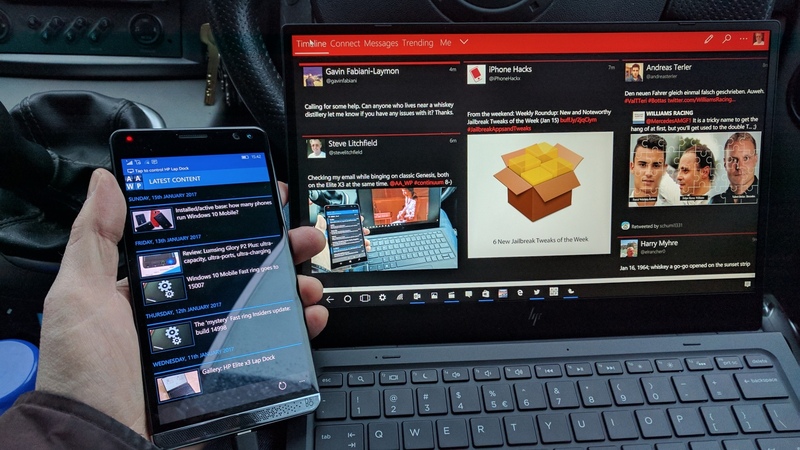 But when the HP Lap Dock is working, whether hooked up to an Elite x3 or a Lumia 950 XL (or similar), it's terrific and unquestionably the coolest, most useful, most impressive and (yes) most expensive smartphone accessory I've ever owned. It's not only a 'lap dock', it's THE Lap Dock, and the others linked above are but pale shadows in terms of functionality and quality. Unoptimised - closing the Lap Dock screen to put it into 'sleep' mode and then opening it again should warrant an almost instant (say a couple of seconds) reconnection to the phone - instead it takes a good 15 seconds and is just as slow as restarting the Lap Dock from scratch - surely this can be massively sped up with a fully working sleep mode? Buggy - yanking the Type C cable out of the phone (e.g. to take a phone call in another room in privacy) and then reinserting it results in the Lap Dock losing its mouse cursor and keyboard, so the Continuum session is effectively hung. The only quick way out of this is to yank the cable out at the Lap Dock end and then reinsert it. This is clearly a bug and I'll do what I can to feed this back to HP. The good news is that the Lap Dock's firmware is trivial to update, via the HP Device Hub application on the phone. It's disapointing that the issues above haven't already been fixed, but I'm hopeful that, somewhere in HP's European HQ, programmers are even now beavering away to improve the firmware. I'll have much more on the HP Lap Dock in future review parts.